President Donald Trump on Tuesday will host Brazil’s president Jair Bolsonaro at the White House for what will be the first face-to-face meeting for the leaders of the two largest economies in the Americas. An ardent admirer of Trump’s, Bolsonaro chose Washington as the site of his first state visit since being inaugurated in January of this year. As one nationalist populist to another, Bolsonaro appears eager to strike up a personal alliance with Trump and to forge a strong U.S.-Brazilian bilateral relationship, two goals which set him apart from most of his predecessors. 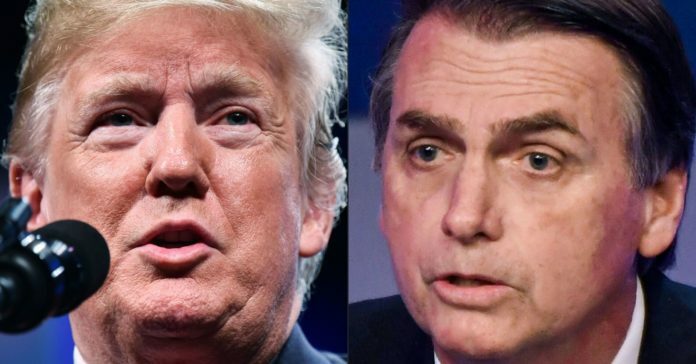 Bolsonaro’s use of Twitter is one of several stylistic similarities between Trump and himself. Others include their bombastic rhetoric, their skepticism of climate change science, their scorn for traditional government ethics and their willingness to publicly attack news outlets if they receive negative press coverage. As a result, some foreign policy experts have taken to calling Bolsonaro “the Trump of the tropics,” a nickname the Brazilian president has embraced. The two leaders are expected to put the political crisis in Venezuela at the top of the agenda for their meeting on Tuesday afternoon. The Bolsonaro and Trump administrations have both recognized opposition leader Juan Guaido as the rightful president of Venezuela, and both called for the resignation of current president Nicolas Maduro. During a conference call with reporters Monday ahead of Bolsonar’s visit, a senior U.S. administration official said the Trump administration hopes the Brazilian military can leverage its historically close ties to the Venezuelan military, in order to convince top brass in Caracas to shift the military’s allegiance from Maduro’s camp to Guaido. “The Brazilian military has very good relationships with the Venezuelan military, and the Brazilian military can clearly communicate with them,” the official said. Bolsonaro is a former army captain who has installed several career military officers in key posts throughout the government. This kind of rhetoric closely mirrors Trump’s own views on trade, which are largely centered around his belief that other countries have taken unfair advantage of the United States, and none more so than China. This philosophical alignment on trade also reflects the views of one particular political adviser who has shaped both Bolsonaro’s outlook on the world and Trump’s: Former Trump White House senior adviser Steve Bannon. Bannon left the Trump administration in 2017, after having served in senior roles on both the Trump campaign and then inside the West Wing. But in many ways, Bannon’s populist, nationalist and isolationist views never left the building, and they continue to shape Trump’s approach to governing, to foreign policy and to the country’s economic priorities. On Sunday night, Bannon was one of a group of conservative U.S. political figures who dined with Bolsonaro at the Brazilian embassy in Washington. Despite the long shadow that Bannon’s dark worldview will cast over Tuesday’s meeting, Trump’s current White House aides struck an upbeat and optimistic note about the meeting.